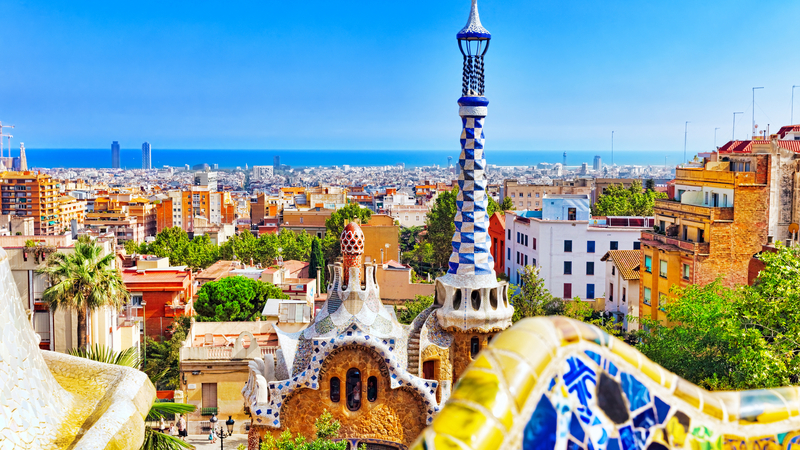 Barcelona is a Mediterranean metropolian city which has a great attraction to the whole world! 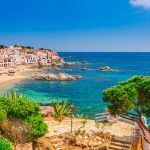 Excellent, you’d like to spend your holiday in Barcelona area! One thing is for sure, you won’t regret a thing. There ain’t anything better than spending your holiday from out of your own holiday home with private pool and the sea nearby. From here you’ll have tremendous opportunities to visit the most stunning hotspots of the area! 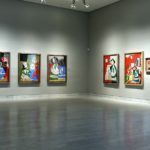 Barcelona has an extraordinary cultural and magnificent artistic heritage. 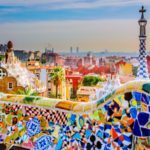 There are lots of books and websites dedicated to it, but take it easy and first take a look at our TOP 10 of Barcelona. Specially for you we’ve selected the 10 sights of Barcelona you definitely need to see! 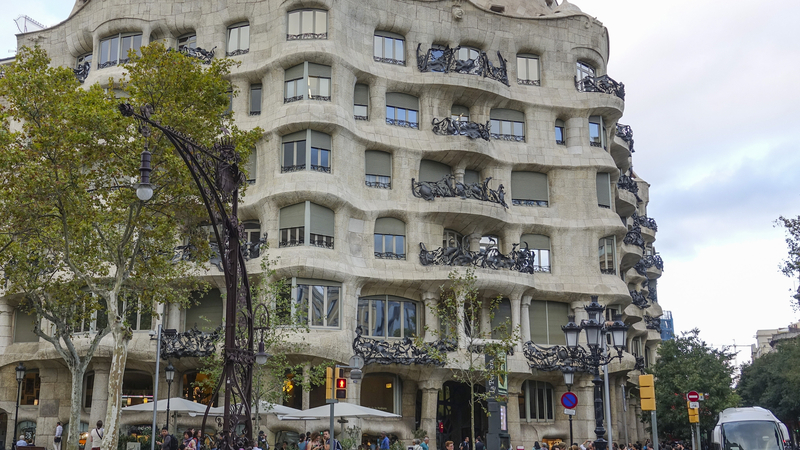 Have you ever heard of the world famous architect named Antoni Gaudí? You’ve probably heard about him or you’ve seen some creations from him without knowing it’s created by Gaudí. But if not, you’ll definitely going to meet Gaudí’s work in Barcelona. Gaudí was the most famous architect of Barcelona and lots of buildings and architectual creations are on his name. For example, la Sagrada Familia. It’s the famous cathedral which hasn’t completed since Gaudí started with it in 1881. It’s expected to be completed in 2026. 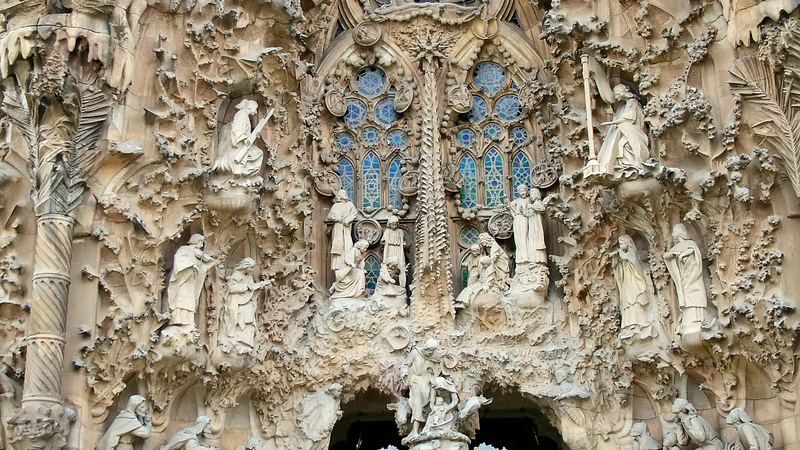 In the meantime la Sagrada Familia has become the symbol of Barcelona. Another impressive attraction designed by Gaudí is Parc Güell, created between 1900 and 1914. In this large garden you’ll discover lots of architectual modernist details. A visit to these 2 major attractions of Barcelona is a must when you’re in the neighborhood! Yes, Gaudí left traces everywhere. So this brings us to number 2 of this Barcelona TOP 10 which we like to recommend to you: Paseo de Grácia. Here you’ll find the Pedrera (also known as Casa Milà) and Casa Batlló. In addition, Paseo de Grácia being one of the streets of Barcelona with the most modernist works, it’s also one of the main shopping street of Barcelona. 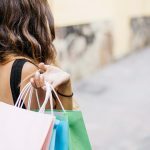 Brands like Chanel, Gucci, Cartier and more of this caliber make it possible for you to shop till you drop at Paseo de Grácia. Though, take a well-filled wallet with you. Paseo de Grácia ends on the famous main square of Barcelona, Plaza de Catalunya. Here you’ll find shops, bars and restaurants of all kind of budgets. Have you ever walked down a street where you can find absolutely everything? The Ramblas makes it all possible. It’s the famous street of Barcelona where you’ll find the most tourists together. One of the tourist’s favorites are the human statues and the street artists with sophisticated costumes. Along the Ramblas you’ll find all kind of flower shops, kiosks, bars, (expensive) restaurants and hotels. Besides the facilities you’ll find down the Ramblas various interesting buildings. 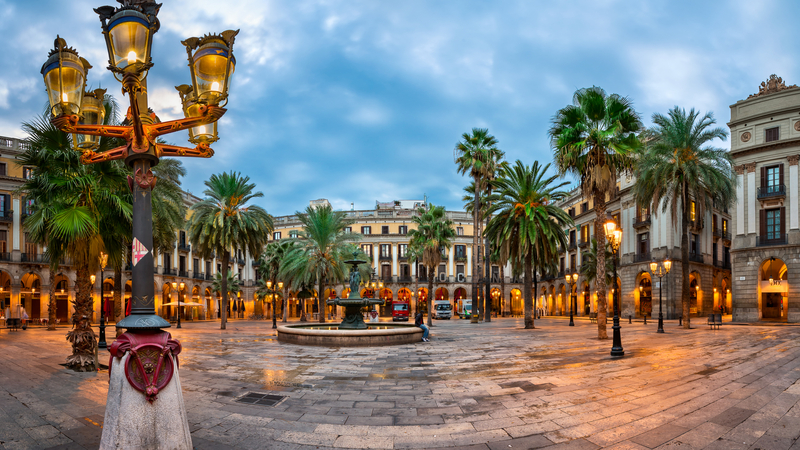 Such as, the Liceu Theater (Teatre de Liceu, built in the 19th century), the palace Palais de la Virreina, the indoor market La Boqueria, Palau Nou de la Rambla, la Casa de los Paraguas (the house of umbrellas)… In the meantime, don’t loose your belongings out of side! Tip: Feel free to explorer the small streets on both sides of the Ramblas. You’ll be surprised how many original things and beautiful architecture are up there. The Gothic quarter of Barcelona you have to visit for sure! 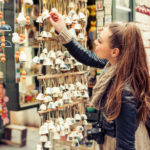 When you’ll explorer this quarter you’ll understand why the oldest neighborhoods of Barcelona is famous for its architectual beauty and its multicultural population. The most typical highlights, which represent the Gothic quarter very well, are the Cathedral, la Plaza San Jaime and la Plaza Real. This are the first places tourists visit, but there’s more beauty to reveal! 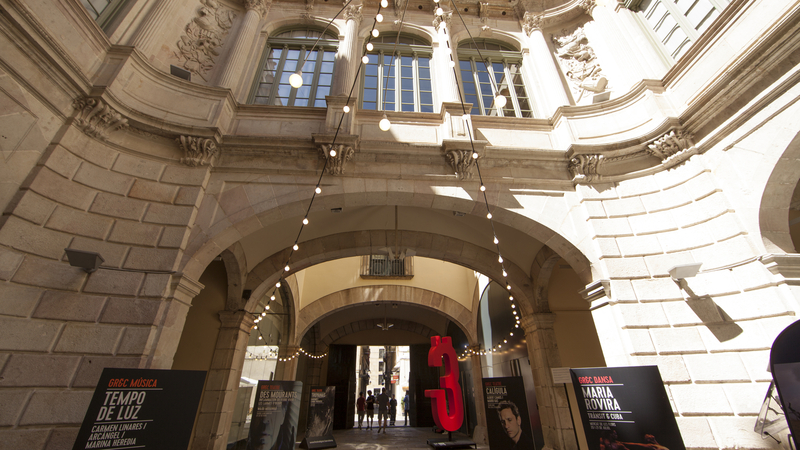 Get seduced by the history of Barcelona, to feel the essence of the city and experience the daily life of local people. So, close your tour guide book, put the map of Barcelona in your bag and let yourself carry away by all the wonderful small tiny streets! You’ll find small bars and cafes which will delight you during your expedition. In Spain the water is very often decorative and aesthetic. The magic fountain was built for the Universal Exhibition of 1929. On occasion of the Olympic Games in 1992 it was fully restored. The fountain is part of a structure with waterfalls and ponds. During the show you’ll see a magnificent lighting effect, produced by the light canons. 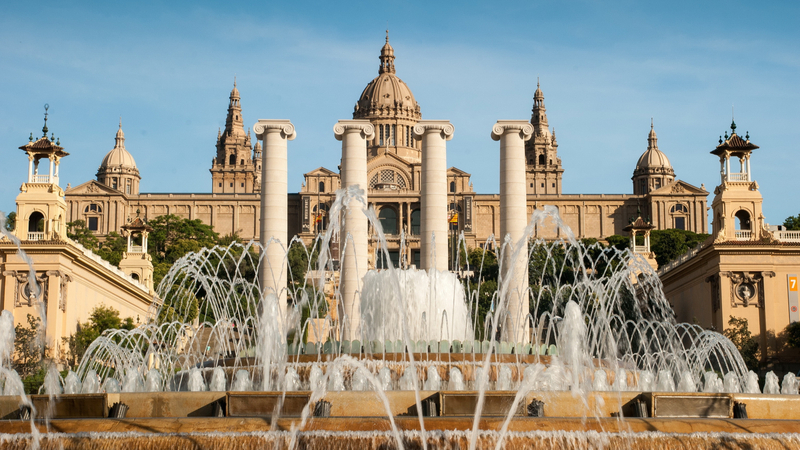 From the MNAC (Museo Nacional d’Art de Catalunya), which is located in the National Palace, you’ll have a perfect eye on the fountain. As this impressive building, inspired by the Spanish Renaissance, is situated on a hill with sight on Plaza de Espanya. Tip: The entrance to the museum is only possible with fee. To reduce your costs, we just like to let you know that the beauty of the fountain and the architectal level is already worth your visit. 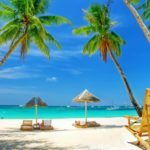 Do you admire the beach? 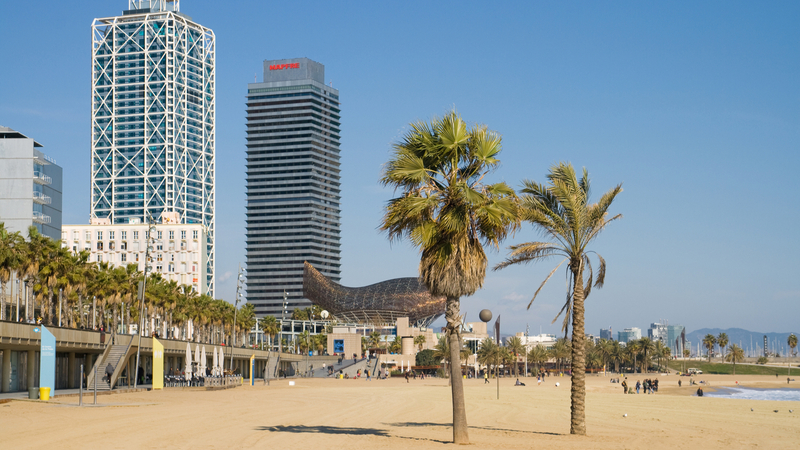 In quarter La Barceloneta Barcelona gives you the possibility to enjoy the beach! You can relax as long as you want or undertake action! A beautiful picture of the coast is waiting for you with the Mapfre tower and Hotel Arts Barcelona. Also good sea food restaurants, trendy bars with terraces on the beach and famous night clubs you’ll find here. Along the beach you’re able to walk on the palm-lined promenade, which is also ideal for jogging or rollerblading. For an ultra relaxing moment excisting out of sunbathing and enjoying a nice cocktail with a tapa, this is the ideal place. Also for a fancy night out with ambiance La Barceloneta is the perfect spot! Yessss! It’s time to watch a match of a great football team! Come over to Camp Nou and support the best team of Barcelona, together with the “culés” (the Catalan supportes of Barça). 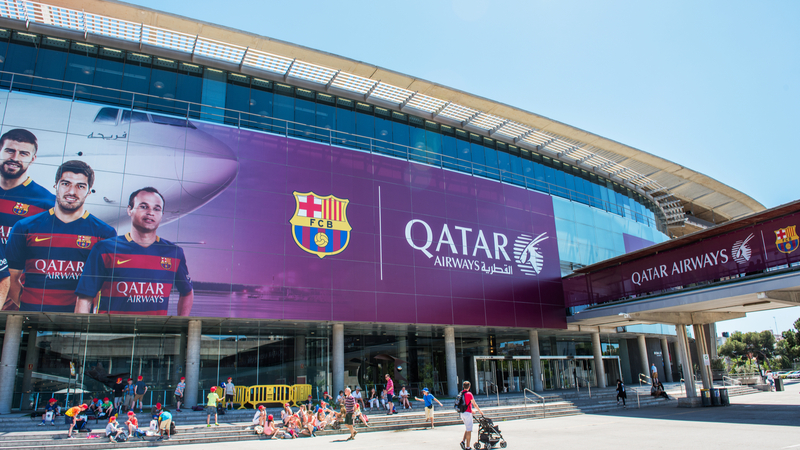 It’s obvious you can’t miss a visit to the stage of one of the best football teams of the world, FC Barcelona! Camp Nou has place for more than 100.000 persons and ensures that every match is a true spectacle. If you don’t have the opportunity to watch a match in the stadium, we still recommend you to visit Camp Nou. Besides that you can take a look around through the whole stadium, there’s also a museum. In the museum you’ll discover the history of this wonderful team. Tip: Please, consult the schedules of the matches and opening hours of the museum, before your visit. Do you prefer a combination of culture and entertainment? We recommend you Tibidabo. Tibidabo is a peak of 516m of la Sierra de Collserola, in Barcelona. From here you’ll have a spectacular view over the cosmopolitan city Barcelona. You can visit various attractive buildings, such as Torre de Collserola or Templo Expiatorio del Sagrado Corazón, but there’s more. Last but not least the amusement park Tibidabo is a must-have-been for every tourist. It’s the oldest of its kind in Spain and one of the oldest in Europe. 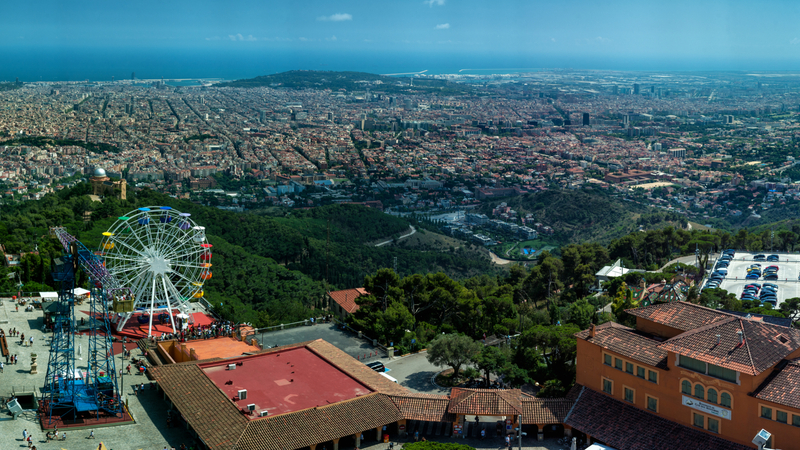 The historical ambiance which Tibidabo gives, you won’t find easily in any other amusement park. Make some time to enjoy yourself here, because it’s worth your time and energy! A visit to Parc de la Ciutadella is a real recommendation for you when you long for a walk through a large beautiful park. 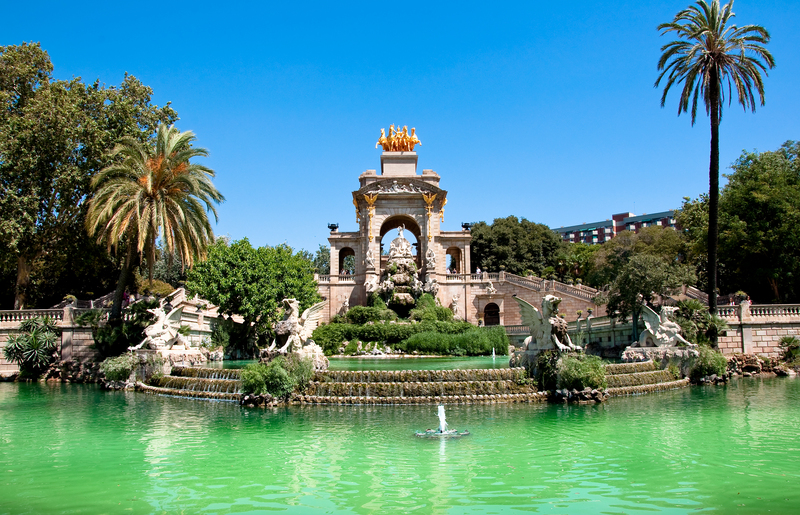 This is the largest park of Barcelona at only a 15 minute walk from the statue of Christopher Columbus. No matter if you come alone or accompanied by your familie or friends, because a visit to Parc de la Ciutadella will do you good. You can relax while you hear the birds tsjilp and sing their song. Or you can take place on a bench and see the world go by. Parc de la Ciutadella keeps lots of vegetation and a lake in the middle. When you’ll rent a small boat you can even enjoy another point of view of the park. The most ideal moments for a visit is in the afternoon or on Sunday. Young and old gather to juggle. And when you’re around, nearby you’ll find the Barcelona Zoo and the Palau del Parlement de Catalunya. In Barcelona there’s more than the Antoni Gaudí madness. 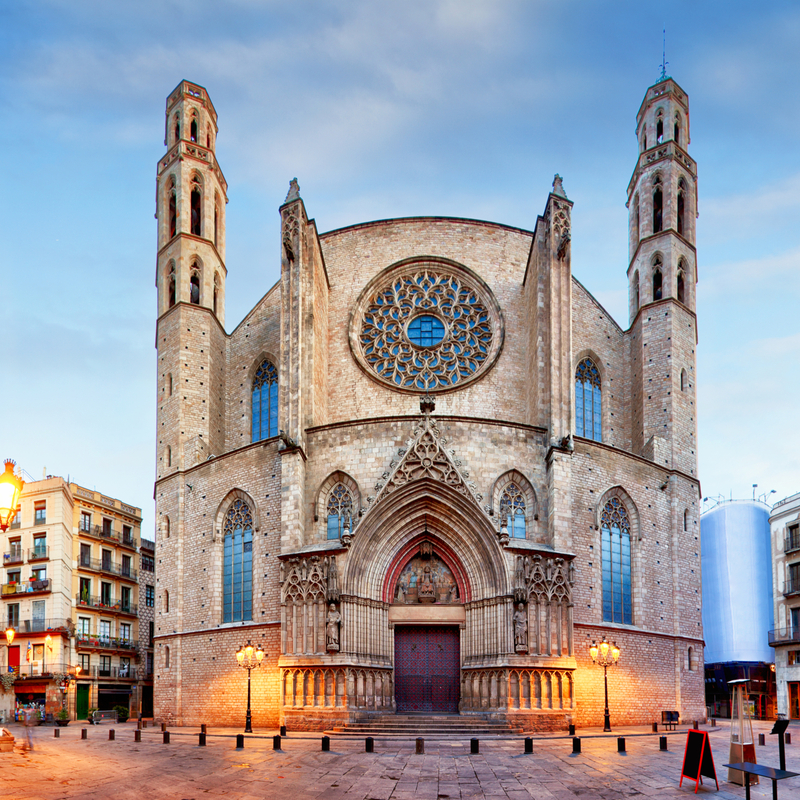 Therefore we present to you the most emblematic example of refined Catalan Gothic architecture, Iglesia de Santa Maria del Mar. The church has octagonal towers, many bare surfaces and massive buttresses. Santa Maria del Mar is located in the Ribera district of Barcelona and was built between 1329 and 1383. This is truly an impressive architectural wonder. Regularly concerts are organized, so if you’re lucky you can join one. Close your eyes and imagine your holiday is going to start! Bring along your family and friends to enjoy together of the holiday of your dreams in your own villa with private pool! Here you can do anything on any moment you feel like it.